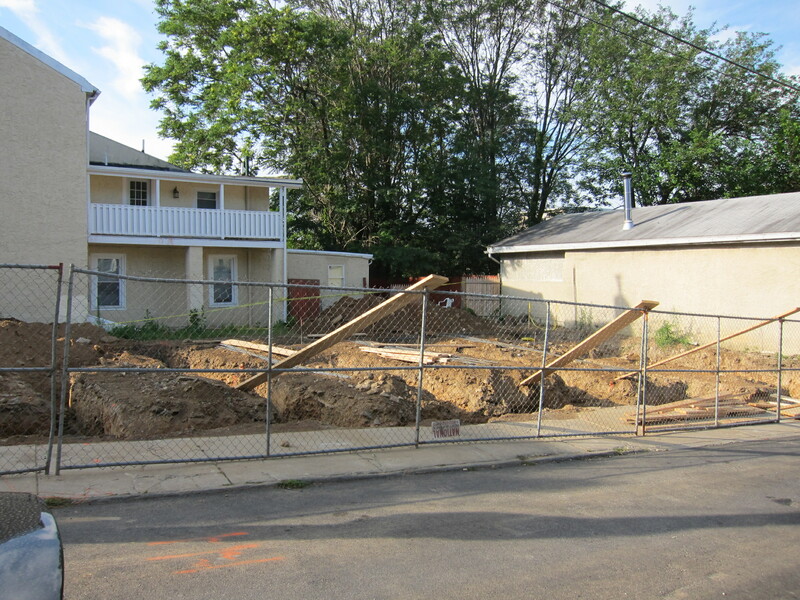 For all the years we’ve lived in our house, the lot diagonally across from us has been an eyesore. Originally a small farm, at one time another structure had stood on that largish, now-urban piece of land; today, only a house, one of the oldest in the neighborhood at nearly 150 years, and a similar-age former stable (now, since moderate gentrification, an artist’s studio) remain, acting as two sides of a frame around the plot, the other two being sidewalk and intersecting streets. 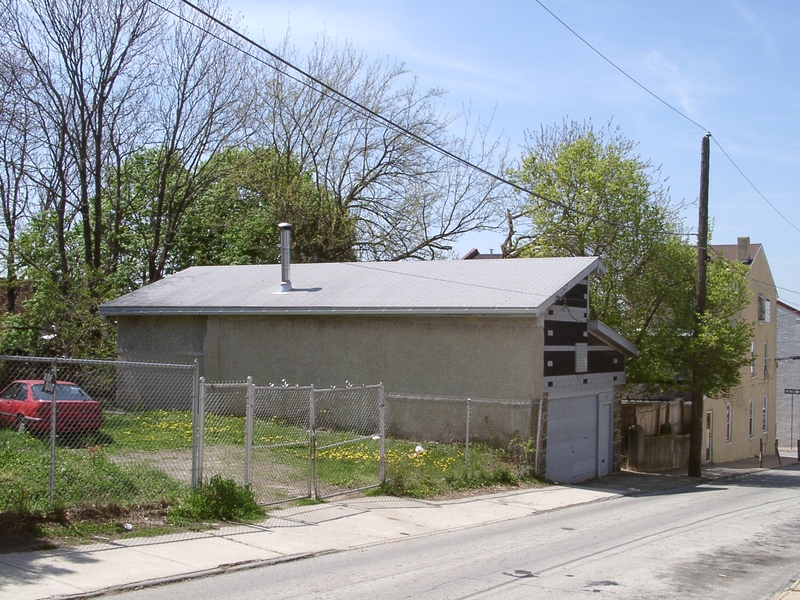 The land – maybe 70‘x 66’ – is, essentially, the house’s ample side yard. For a while, when an elderly woman lived in the house, there was at least an attempt at keeping up the yard. Grass grew patchily on most of it, and the woman had a neighborhood man (in some way related to her) cut it, as well as occasionally trim the scruffy bushes that grew wildly in and around the once-beautiful, classic cast-iron posts and rails that bordered the property. 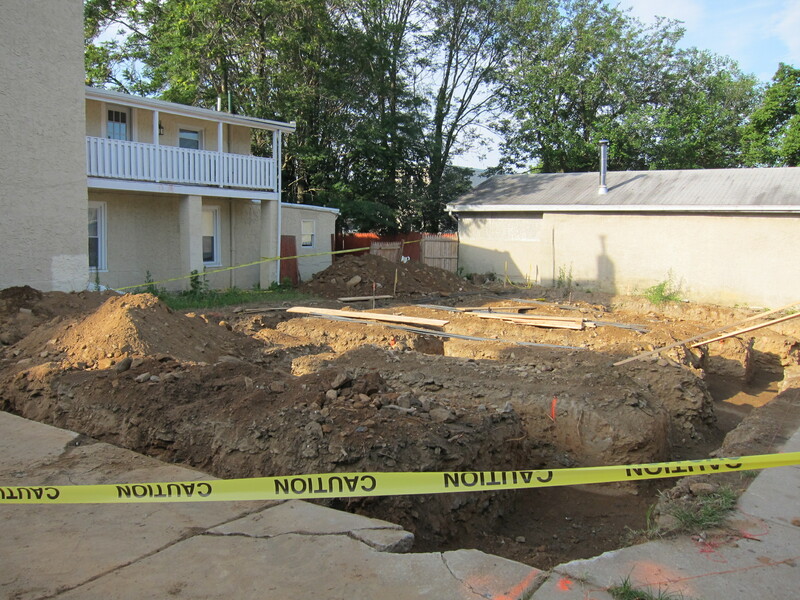 But there was also an improvised barbecue pit – literally a pit, dug deeply into the ground. And a ramshackle, lean-to of a shed housed an old yellow dog named, ironically, Champ (the first in a series of poor dogs over the years, one of whom had the good sense, fueled no doubt by desperation, to slip his chain, dig under the gate and race into the night, never to be found). “The Idiots” moved in after the old woman got sick and died. “The Idiots,” as we came to call them, were composed of the old woman’s sister, the sister’s grown children and an assortment of kids whose parental lineage would give pause to scientists doing genome mapping. This crew hissed and ranted in frustration and bigotry, making no friends except for the paranoid zombies they sold drugs to. And, under their stewardship, the yard went to hell: it became a dust bowl, as most of its grass died or was worn away, and what remained grew as crazily as its untending and untended humans; the graceful fence was torn down and pillaged, replaced with chain link; trash, broken toys and detritus of all sorts were strewn all throughout the yard; and cars, dragged in, unworking, were left there, the silent victims of the elements and the house’s perhaps mentally disturbed and certainly surly teen boy, who would attack them with baseball bat or an axe, smashing them into ruin when he wasn’t otherwise occupied in hacking at the bare earth with whatever destructive implement he could find. The people were horrible; the yard was terrible. After police raids, foreclosure pressure, housing-inspector revulsion and several ownership changes, what sits there now is an earthmover that has scraped the land raw into a simulacrum of the lunar surface and scooped out a network of trenches in preparation for the construction of three new houses – a foolish project of truly pedestrian design, built unnecessarily in an economic climate that predestines its doom. 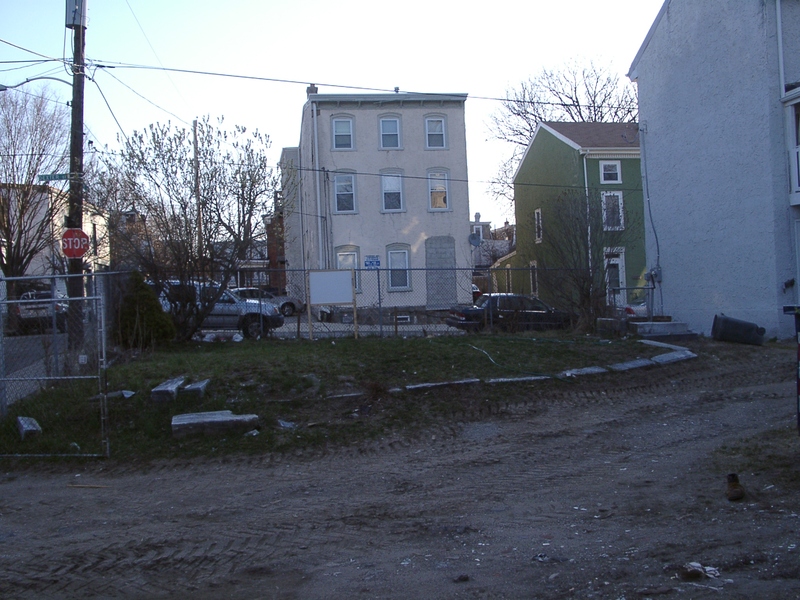 As I try to picture that trio of sticks and stucco creating a wall of residential impermeability, I find myself experiencing something akin to nostalgia for that ugly, gap-toothed yard. It had some, if not much or lovely, greenery. It had a rolling contour and non-uniformity. It provided, if not the open space beloved by environmentalists, then a sense of welcome, air- and light-filled elbow room. It said: Not every square foot of a residential community needs to or ought to be covered with the fruits of a design-built imperative, not every square inch needs to host development. 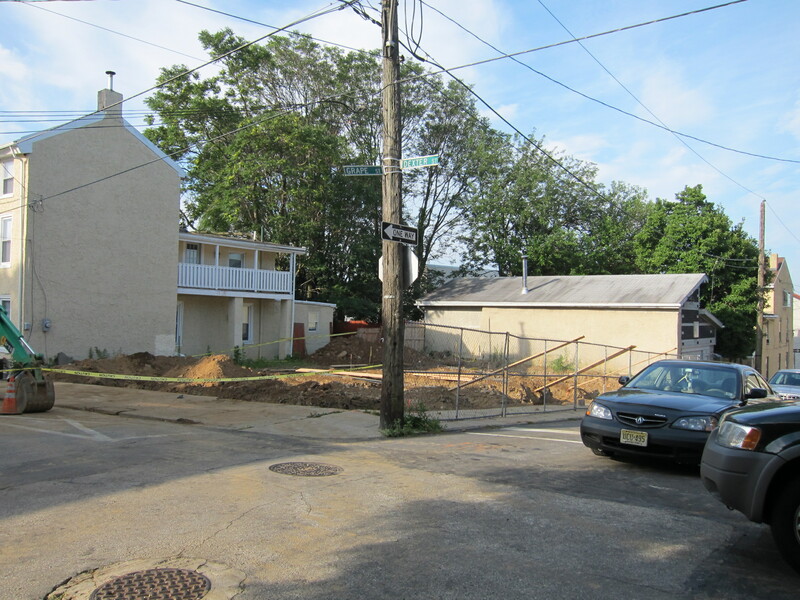 What will be lost is standing on a sidewalk with ground-level all around you; where there was a breeze there will be a curb cut, a garage door, a three-story cliff face and the hum of air-conditioning units. What that homely piece of land said was: Even an unkempt, ignored, even abused space has something of communal value to offer, if only to be a landmark and a bit of shared history. Once the houses are built, no longer will I be able to glance out my window and see the lumpy and irregular wall of the former stable, the elegant hawthorne and redbud trees in its backyard, the houses and chimneys beyond – the art of years-long, organic, unplanned growth of a human-scale settlement. Often, one will not realize that a place has placeness until it is a casualty of “replaceness.” One can frequently not see the art until it is succeeded by the artless. Already, with its terrain stripped and full of ditches, that old, ugly, rotten piece of land, with its genuine “beauty” and rarity, has become something I miss, even as the genuinely crass pushes it out of everything but memory where, oddly, it will only grow in my affection, and be a place I recall not just with fondness, but with the weight of a keeper of the keys to things past and gone. Journey to the past for a moment. Some people do it with an easy preference for the version that resides in their memory – the past being just the span of time that they themselves can remember – and at the other extreme there are those who think that the immediate now is everything. It has always been curious to me that many folks (ghost hunters excluded) have no sense that any previous tenants ever occupied the space they inhabit. Oh, there are the generational families that have a feeling of ownership based on decades or centuries of their bloodlines continuing to possess the same land or house. 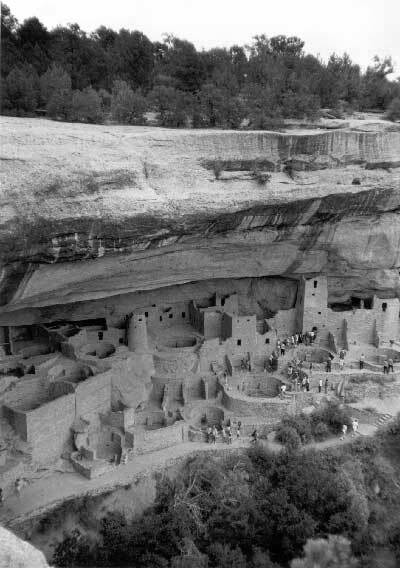 Native Americans had it right in that we are all temporary and our use of land is temporary, at least until the final resting place – and even that is iffy. It occurred to me, after attending a lecture by an archaeologist (this is someone who is keenly aware of previous existences), that the making of and remaking of places come and go with needs or desires. We see it happening before our eyes, with thousands of acres of farmland being developed into tracts of mostly unnecessary housing. The frightening thing is how few of us have any awareness that a good portion of this country was once densely tree-covered, so much so that, it is said, a squirrel could have traveled from the Atlantic Ocean to the Mississippi River without ever touching the ground. And despite the apparent woodlands along empty interstate highways looking like vast forests, these tree-lined strips are often narrow boundaries dividing roads from nearby settlements. A squirrel would have to drive the distance now. 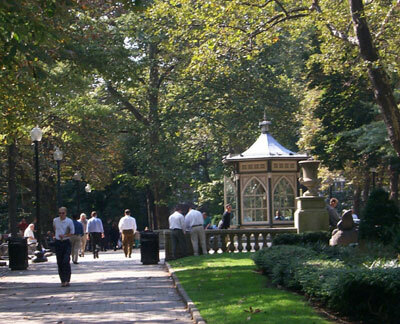 The lecture was about one of the squares conceptualized by William Penn in his Green Countrie Towne for the founding of Philadelphia. His rectangular plan allowed for a center square and four others positioned equidistant from it at its radiating corners (Centre, Northeast, Northwest, Southeast and Southwest Squares were the original names). It was Penn’s proviso, in his city vision, for public parkland, the layout of which is visible in surveyor Thomas Holme’s “Portraiture of the City of Philadelphia,” published in 1683. Looking at them in their present state, you wouldn’t be able to guess that until the 19th century these squares were used for a multitude of purposes, including public hangings, Revolutionary War soldier burial grounds, market and auction sites, animal pastures, church graveyards, munitions storage, fairgrounds, the first reservoir and waterworks, city hall and lastly, parks. Penn, most likely, would have been horrified by most of the uses since, by their very nature, “use” was not the intent, but, rather, escape from use. Then, finally, the changes in city expansion made fashionable parks desirable to the Victorians, and so they remain today, with some alterations. Humans create and have created places no matter where or what they are or were, layers upon layers, structural foundations over the yellow-fever victims, walkways and fountains over the convicted and hanged, merry-go-rounds over a powder magazine, a casino over a Native American fishing ground: one history replacing another in a perpetual recycling of space. There is an ebb and flow, with valued space being devalued and given over to a tenderloin district, accommodations made for roadways and the ubiquitous automobile cutting off easy public access of once strollable destinations, disappearing forests and native species’ habitats. Mostly, in our country, use is determined by profitability. Thankfully, profitability can be interpreted as and influenced by a tax base who desires some green space. People make places anew every day – it seems to be a part of the animal. 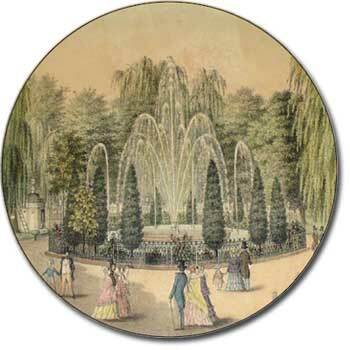 A place of need or desire in 17th and 18th century Philadelphia was very different from the one of 19th and 20th. And what about the 21st? In the ever-changing adaptations of land, what gives a place a kind of placeness – not an artful one, necessarily, but one of depth – is a consideration of what it has been, what came before in each incarnation and, most importantly, how you will contribute to it, how you will leave it: Will it be better than when you found it? Are you doing justice to its legacy, to its past? Awareness of what preceded you is essential. Treat the land with the same respect that you would give an aged ancestor, for that is what it is. It has life and history just like us, only much longer, and deeper. 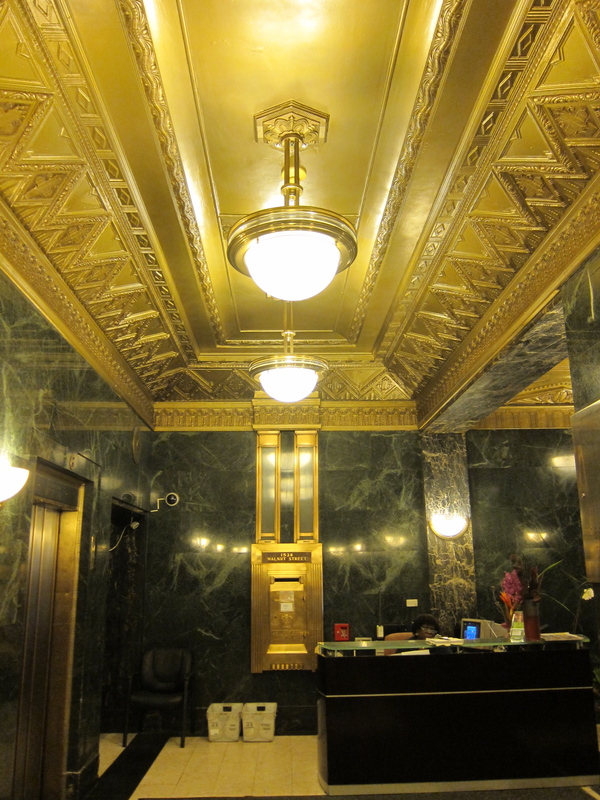 We took a tour, last week, of Philadelphia’s Art Deco architectural treasures. We live in Philadelphia, and happen to be familiar with all the buildings that ended up being on this particular show-and-tell, organized under the aegis of the city’s Preservation Alliance. But, when one is in pursuit of examples of placeness as art, it’s easy to overlook the right-in-your-own-backyard obvious and known; guided group perambulations-with-purpose have a way of jogging one’s memory and taking disparate elements and free-floating thoughts and bringing them together in coherent focus. You come to realize, suddenly, that the things you didn’t know you were thinking about were, really, things you were thinking about a lot – just maybe in different ways. Philadelphia is a wonderful place to look at the history of architecture in the United States – so much of what has been built over the past several hundred years still stands and is being used, beneficiaries of a strong conservative bent, a general thriftiness and development that began at the Delaware River in the 1600s and marched in an organized, gridded fashion westward and outward, leaving a timeline of changing styles, construction advancements and reformulated population patterns, needs and wants in its wake. Colonial? It’s here. Victorian? Yes. Gothic Revival? Beaux Arts? Federal? Check, check and check. 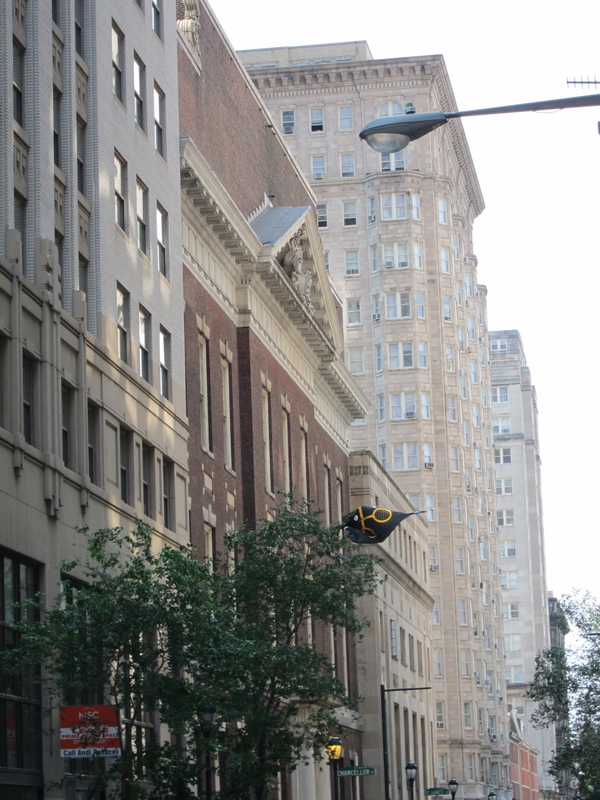 One can glance down almost any street in the downtown area, known as Center City, and see a row of office and residential buildings cheek to jowl, each from a different period, living in an organic harmoniousness. 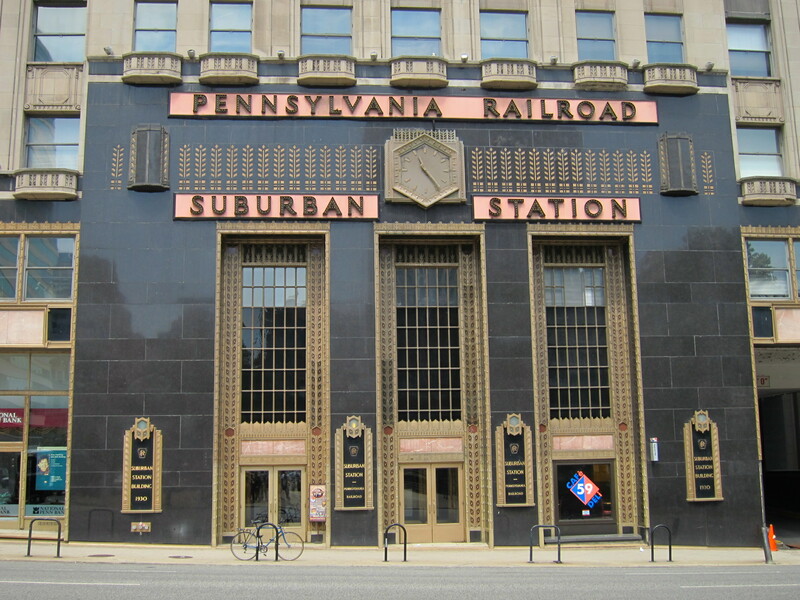 There isn’t much Art Deco in town; it was, perhaps, too shockingly outre for staid, Quaker-ish Philly in a period roughly spanning the years from just after World War I to just before World War II. The 19th century still held stylistic sway at the start of this time and, later, restraint and retrenchment in the name of recovery was in the air. 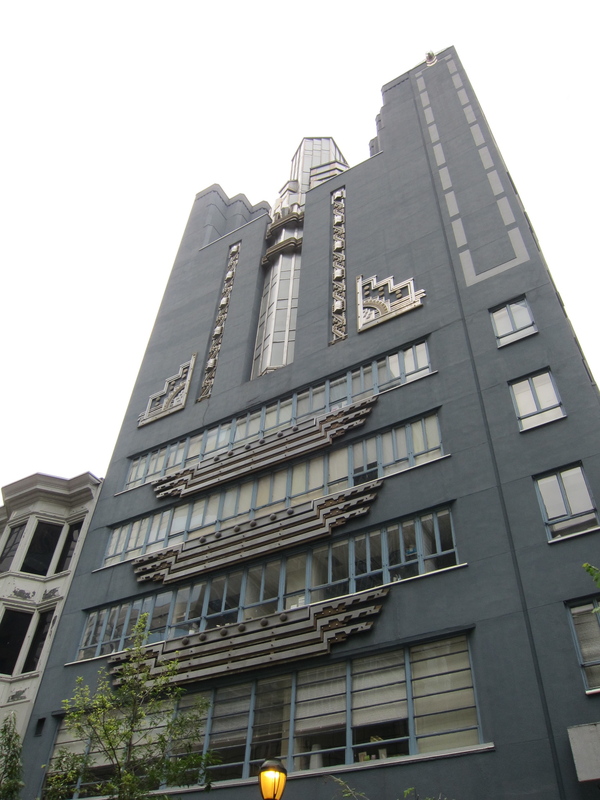 What there is of Art Deco here isn’t as flamboyant or defining as the examples to be found in, say, New York City, or Miami, or Los Angeles. But there are some nice examples – mostly built to be headquarters or regional outposts of large corporations or broadcasting companies, Big Oil and Big Transportation. The tour guide showed us these buildings – all tall, with soaring verticality, many with terra cotta ornamentation, some Moderne, others Mayan-influenced. 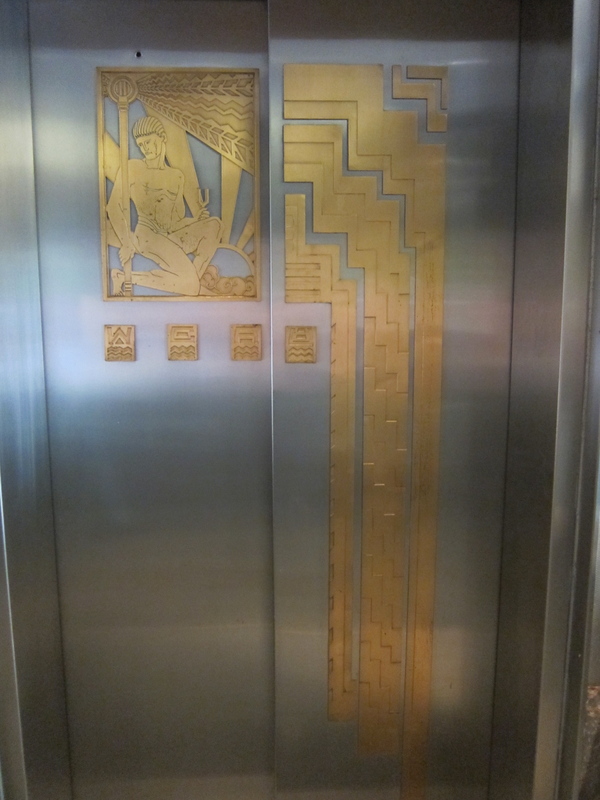 We entered lobbies modest in girth but glittery still, with streamlined elevator doors, monumental mail boxes, terrazzo and brass, aluminum and gilt. Impressive spaces created as coordinated and complete visions, from door knobs to desks to signage – all with the look of the promise that began roaring in the ‘20s and careened, a bit drunk, into the financial and world-war abyss. A sliver of time, with an outsized and ongoing influence. For the United States, one of the last times of un-ironic optimism though, like most of our optimisms, doomed. We at arslocii are Art Deco aficionados – buffs, even. We live in reimagined Deco surroundings, we’ve traveled long distances to see Deco buildings and artwork, we believe firmly that it was a glowing time and that Donald Deskey, Raymond Loewy and Henry Hohauser are demigods. 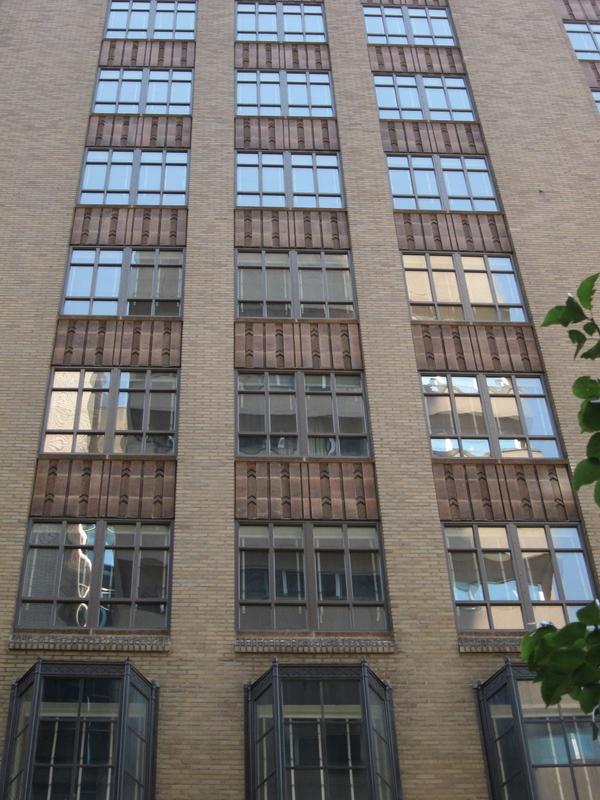 Yet, as our tour guide pointed out the set-back facades, the patterned grille work, the glazed spandrels, the symbolic renderings – all this, coupled with our affinity for the modality, and yet … we were left lukewarm, admiring but unmoved, appreciative but not enraptured. There was no placeness there. But why? These buildings, inside and out, were intentionally designed to be different, to be art, to be places redolent of placeness. Their out-of-placeness should have, could have imbued them with placeness. And, then, we saw them: Just across the street from one of the tour buildings were two short, relatively inconspicuous structures, literally overshadowed by the Deco tower we’d just exited. 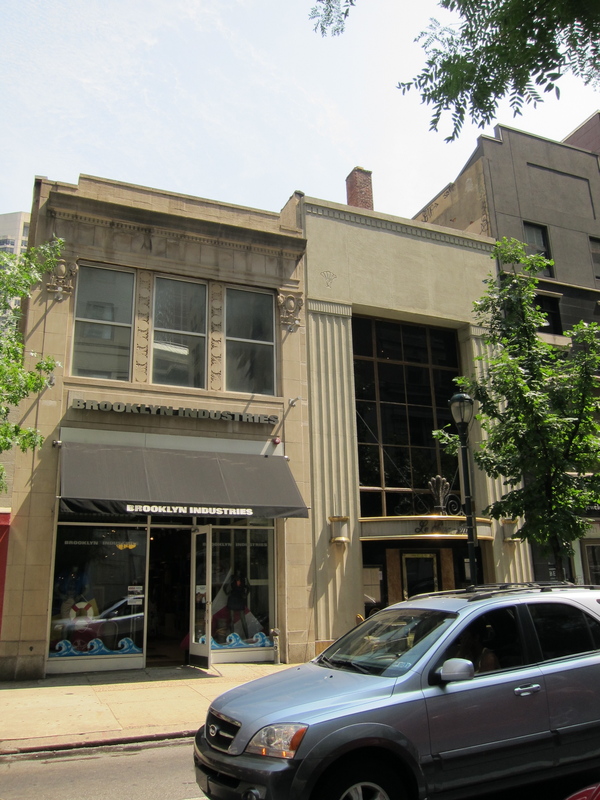 This attached pair of modest commercial properties – one very Deco-ish, the other a bit older in affect – struck us, instantly, as having everything that was missing from their bigger siblings, including and especially placeness: their simple but perfectly proportioned and resonant lines, their shy but glamorous attitudes, their under-adorned but bejeweled facades. They weren’t trying as hard as the big buildings to be big: no huge gestures, no forced glitter … yet, wonderfully alive and, it seemed, real. Authentic, not just of style but of heart. And built to human scale. If one finds them breathtaking – and one should – it is because of their honesty and not the flaunting of their corporate owners’ budgets. What it comes down to, it seems, is scale – in physical size, in architectural ambition – and the seemly gesture; accessibility – physically and intellectually – and the successful provision of just enough and not too much. 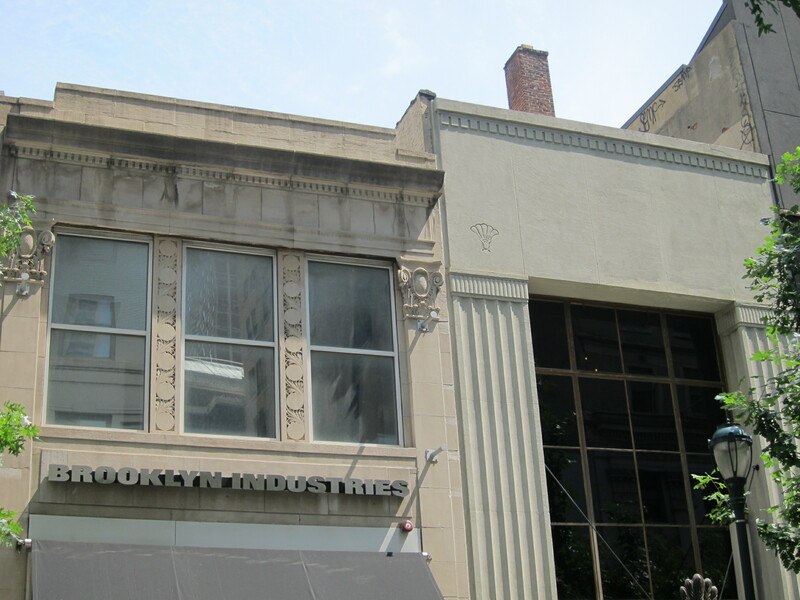 A viewer feels that he could wrap his arms around these two buildings in a happy embrace, and they around him. Lessons learned here: One can stand tall without being tall; one can have placeness without being built to be a place. It’s a magical thing – alchemical, even. And inexplicable. It just happens. Thankfully, it happens here. For some of us, there is nothing better than looking at the world from a bird’s-eye view, a perspective that hovers above the earth-boundedness that we are born to endure. The preferred height varies with personal taste, but I find that anywhere between ten and thirty feet in the air is a happy place – like being in a tree, only not at the top. There is a feeling of elation, of being removed from the action below but still involved in witnessing it. Maybe it just reflects a desire for distance from societal traditions or norms, staying out of and above it all. Maybe it is the god complex in us. In terms of height and distance, there is no place that could use such a sense of separation more than New York City. 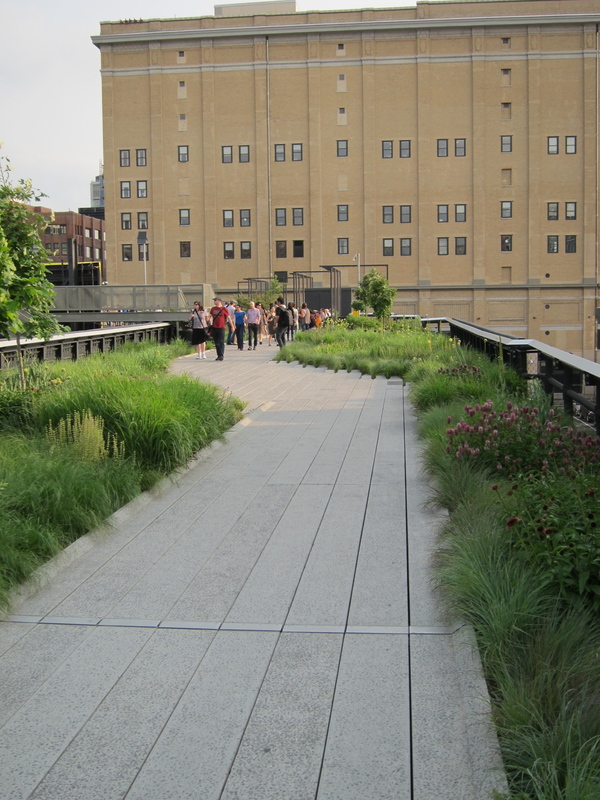 Enter the High Line, a remarkable effort combining infrastructure preservation, green space and landscape architecture to create a public space for strolling, watching and relaxing without encountering a single automobile. 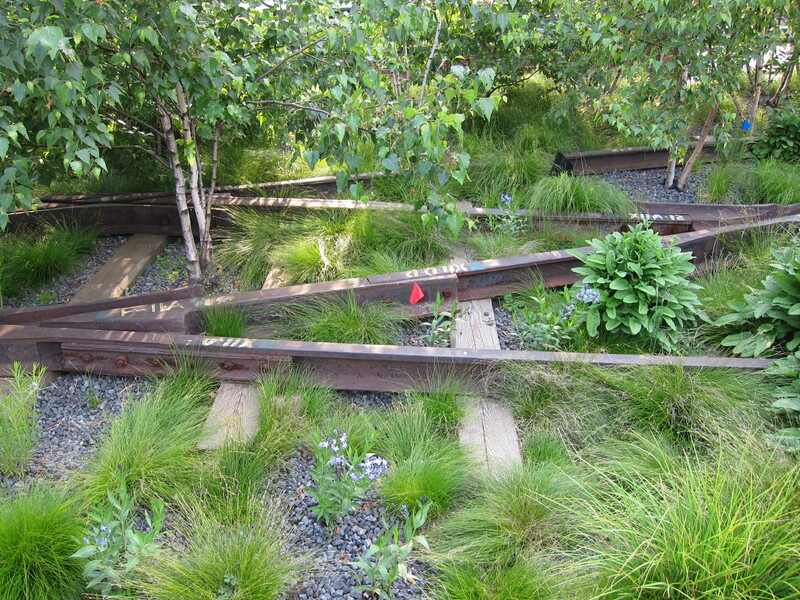 The brainchild of two inspired residents of the west Chelsea neighborhood it transects, this abandoned elevated freight-rail structure built in the 1930s became overgrown with reassertive nature, and the instigators and other local residents attached themselves to it as much-needed and -desired park land, weeds and all. After forming a “Friends of” group in 1999, politicking, maneuvering and fundraising, their dream of a magnificent public park was realized about ten years later. 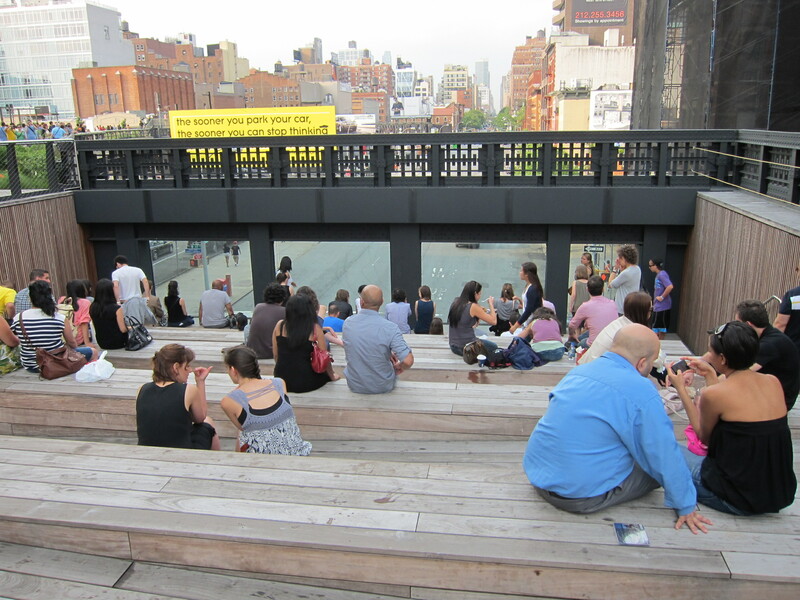 The success of its presence has revitalized the neighborhood that the High Line weaves through; a jewel of an elevated greenway that any section of Manhattan would covet, its original length (10th to 20th Streets) is now, in fact, in the process of being extended all the way to 34th Street. The magnificence of its structure is a given, since even 1930s institutional styling is considered and decorative in a riveted-steel aesthetic – something done well even just for delivering products and goods to the upper floor (2nd and 3rd story) loading docks of factory buildings and warehouses. 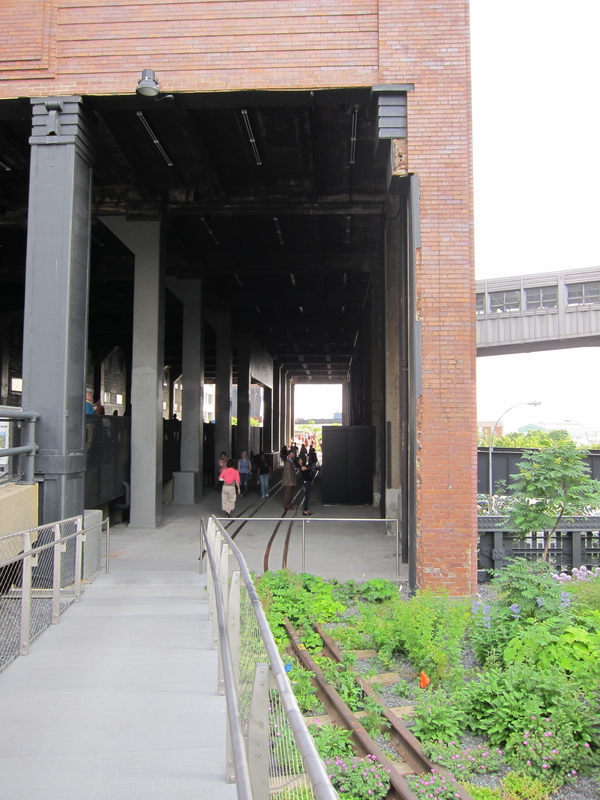 One of the best things about the High Line is how it zigzags into, through and under buildings, causing a stitching together of the rail line with the local architecture and creating tunnels and interesting spaces in the pierced structures. 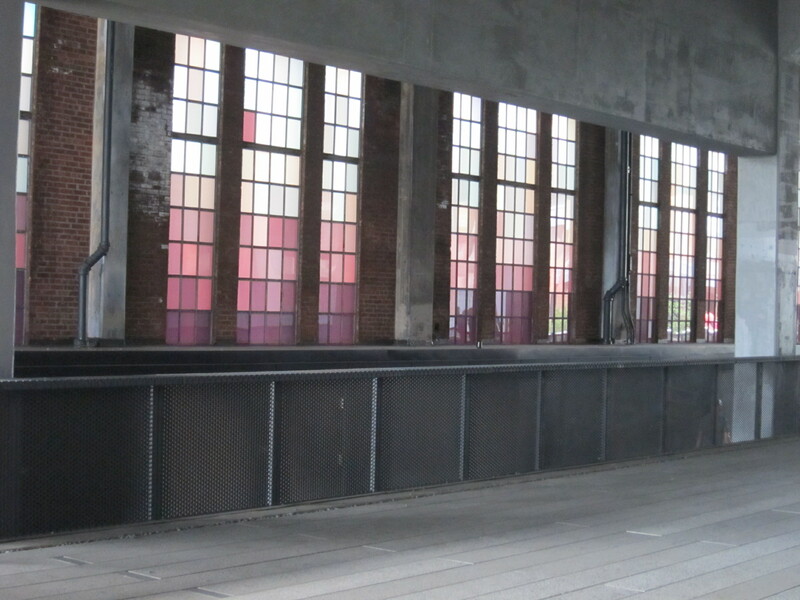 One, in particular, feels like an old rail station with tinted glass panes all green and yellow and more than a story high on the building’s interior side: a screen between the train and its dock. Another remarkable thing is the number of unique views available to the casual stroller from this perch: the Hudson River, the streets below, the sky so close you might think you are in Montana, up-close building facades, views down onto rooftops exposing all their mechanicals, lovely penthouses above, funky makeshift roof decks, water towers, skylights – it’s all there … well, it’s New York. One of the best sensations, and one not caused by passing traffic, is breezes – breezes off the Hudson, something that is rarely felt in the canyons of the city. The promenade is a textural place made up of a variety of hard surfaces (terrazzo planks, wood, steel grating, stainless steel, corten steel, glass, gravel, some of the old original rail tracks left in place, metal-wire chain link, perforated metal and sections of railings that resemble train tracks on the vertical) plus a mix of soft but hardy meadow plants and grasses that will grow in with the same wildness that the uninvited ones had done. In its newly finished state, the promenade is a little too perfectly designed, almost like an outdoor mall (but without the shops, thankfully, and they are working on a water feature) but the feeling is that it will grow together in a way that a mall never would, especially with the planks’ fingerlings that merge and intermingle with the planted areas. The walkways move in and out, funneling and narrowing and then widening to form plazas. There are benches galore, and in some areas there are wide two-person chaises (a few move on rail tracks) that are probably always occupied. At one spot there is stadium seating that faces four large picture windows looking out over 10th Avenue in an inviting theater of the absurd showing you what it is you have left below. 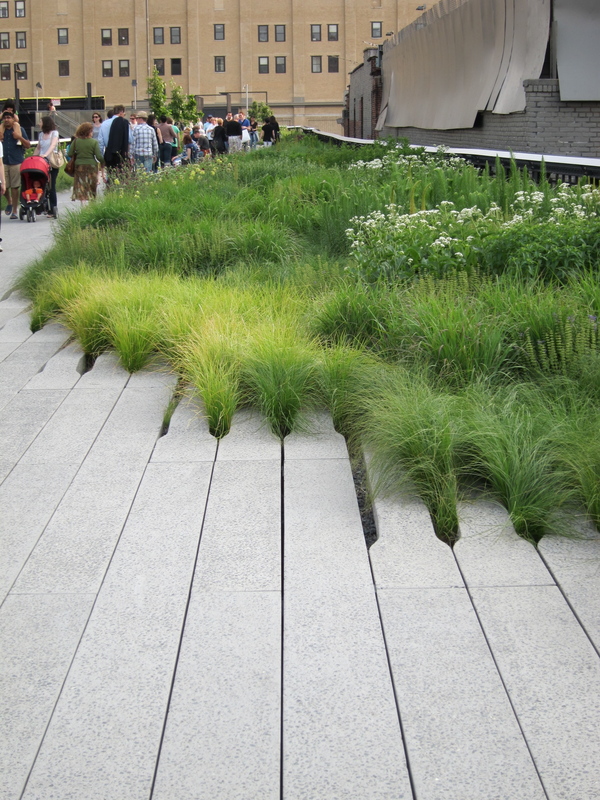 This is a boardwalk reconsidered and reconfigured and built with self-sustainability in mind. Its newness and destination-ness (and tourist-ness) is something that will eventually morph into a real part of daily living. The multiple layers of place taking place here are challenging. There is the place of the structure itself, one that was intentionally built not to overpower the street but rather to cut through the center of the blocks themselves, including buildings – in hindsight, a miraculous and magical solution that works well to this day. And those cuts create places, underbelly places that you would expect to find in a city. In its repurposed design, new physical places are created, as well as the unique viewable places discovered at this happy elevation on a flat island in-filled with mostly monolithic structures. The idea of this project has a placeness, in creating an elevated park in a densely built urban site. It is its own world, new land found and reclaimed within an impossibly already staked-out territory – that in itself has a remarkable placeness. 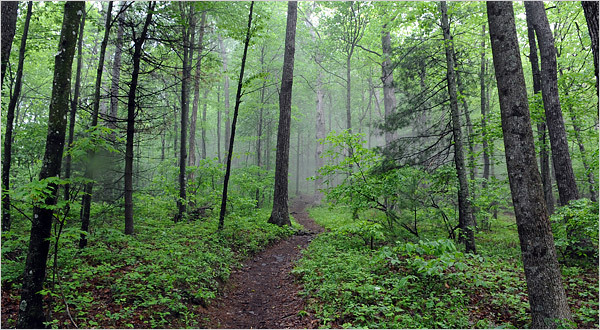 But the real placeness will occur when nature asserts itself, and the hard manmade surfaces aren’t the most significant or overpowering part of the equation – when a balance is reached and some wildness returns. 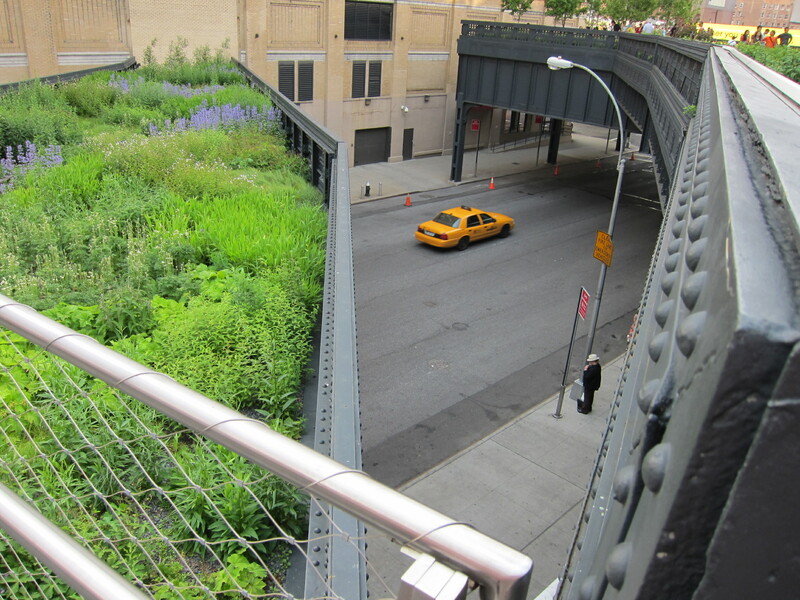 Until then, it would be wonderful if the High Line continued for the entire length of the island. Or even on into other states. And maybe we should see it as a preview of what can be done with all the horrible interstates and their clover leafs when the oil shortage puts an end to the car madness. In a May 31, 2010, New Yorker piece about the writer Somerset Maugham, in a section discussing his novel “The Moon and Sixpence,” Ruth Franklin writes: “If genius is originality, then the narrator knows that he lacks it; his art is something that he chooses to do, rather than a passion that has chosen him.” The narrator’s opposite number in the tale, Charles Strickland, is, to the contrary, compelled, propelled to paint, at any cost; his passion hasn’t “chosen him,” he is a slave to it. It is this classic, uber-romanticized wannabe/has-to-be dichotomy that is also at or near the heart of June Finfer’s play “The Glass House” (concluding its New York run of a Resonance Ensemble production on June 5), which looks at the difference in approach and character between architects Ludwig Mies van der Rohe and Philip Johnson, and by so doing offers up a historical-cultural analysis of their respective glass houses and their drive to realize them. Finfer’s intelligent, studiously researched and slyly complex fact-based drama at its base has to do with the search by Dr. Edith Farnsworth for the Mr. Right to design a place – on some acres of land that she owns in Plano, Illinois – where she can spend weekends away from her practice and research in Chicago. It is to be, she states, a work of art that she can escape to. She is sent, on Johnson’s recommendation, to the Chicago-based Mies, and there the game of power plays, seductions and pilferings – of hearts, of thoughts, of dreams – begins. 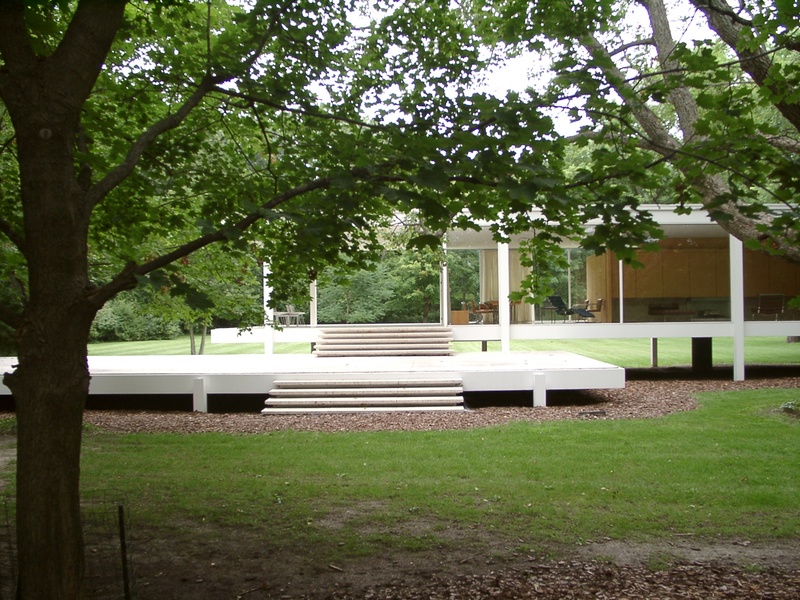 Mies wants to do Farnsworth’s house because he could use the commission but also because he’s been working on a concept of a place with placeness that would appear nearly unplaced, practically invisible – a palpable “thereness” constructed to emulate “nothingness” as much as modern architecture can. Farnsworth wants her place of art, but, maybe too, her place in art, as she wants input into the project. 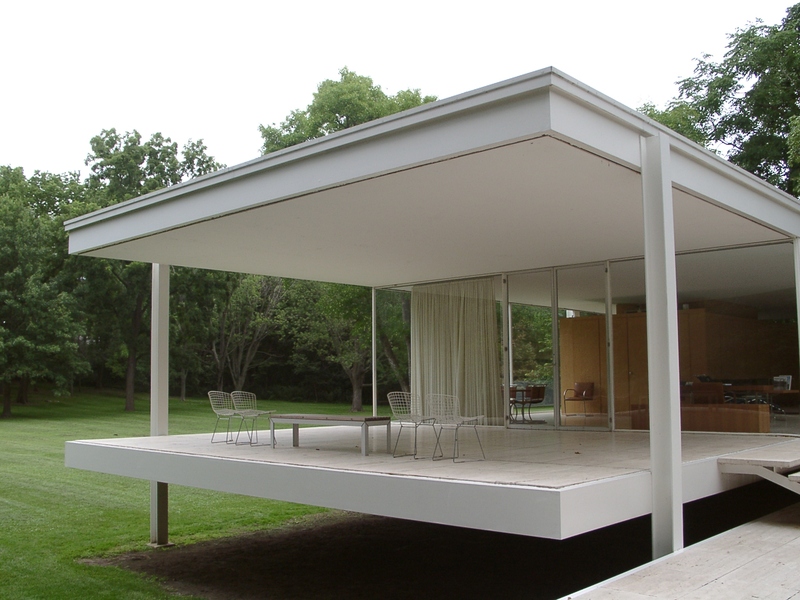 Johnson wants to be kingmaker, and then king, by seeming the jester; but, all the while, this “magpie,” as Finfer has Mies call Johnson, “steals” the glass-house concept in order to build his own and to do it before Mies can get his off the ground, literally and figuratively. But, the play implies, Johnson is but the narrator to Mies’ Charles Strickland. Yet Mies‘ passion is a cool one, a manipulative one, a selfish one, and even in his conquests (of Farnsworth, of artist Lora Marx) he is merely working out ideas, and observing his own reflection in the structural glass. Still, when it comes down to it, the play is not about conflicts and soap operas, the artist vs. patron relationship, the pure vs. the second-rate, original vs. copy, understanding as opposed to imitating, or the deadly position of being caught in the crossfire of egos – it is about all those things but not essentially about them. What the play is about – and who the central, most charismatic, most powerful character is – is the house. The people are merely moths drawn to the light of the idea of it. And everybody gets their wings singed: Mies by getting fired off the job before its completion, and then sued; Farnsworth by so dreading the place that she ultimately leaves it for an Old World villa in Tuscany made of stone; and Johnson, by erecting his “homage” first but having, perhaps knowingly, the inferior model. 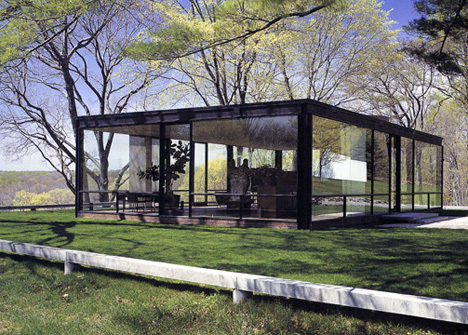 In our wide-ranging arslocii quest, we have had the privilege of visiting both glass houses, first the one in Plano and later the version in New Canaan, Connecticut, both of which we have discussed on the website that this blog accompanies. Viewing them, being in them, and contemplating and comparing them is a lesson in differences and intent, presentation and impact, and of less being more. 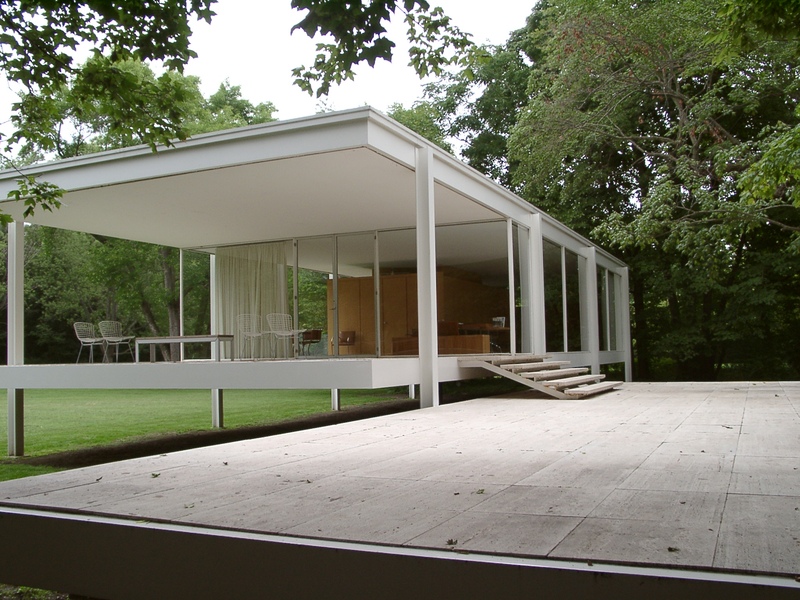 Briefly: The Farnsworth House, in the middle of nowhere, is found after a stop at an extremely modest shed of a visitors center and then a stroll along a wooded path to a clearing, where it levitates, light and bright, presumably but in actuality unsuccessfully above the Fox River’s flood line. The house is unassuming in its power – like the Vanna Venturi House, in a way, it not only hides its light beneath a bushel, it literally hides. Not shy, but secure enough to not need to draw attention to itself. Placeness abounds with deceptive ease; it is its nature. If not bought and preserved by Lord Palumbo (who also saved Frank Lloyd Wright’s Kentuck Knob), this house could easily have been damaged by water, swallowed by forest growth and left to rot, found a century later by archeologists or lost to memory, or known only by reputation and loss, like Mies’ Barcelona Pavilion. 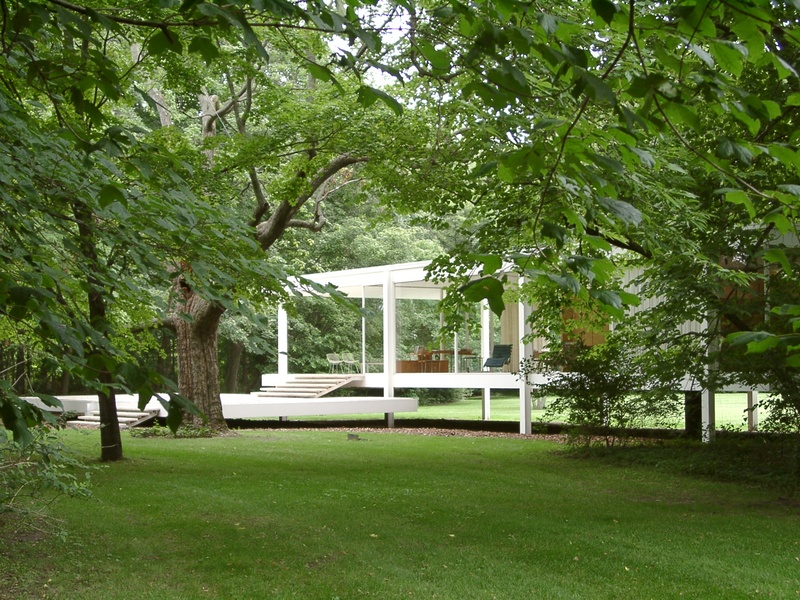 The Farnsworth House projects both the casual and the formal, the friendly and the reserved, the object and the theory. To lay eyes on Johnson’s glass house – and one can do only that; photo-taking is prohibited – one must first purchase tickets well in advance (and there are various levels of access, with prices to match), then arrive at an impressive, design-y in-town visitors center, which offers to those waiting for their tour a multimedia wall featuring moments in the life of Philip Johnson (from near-birth on), famous people talking about Philip Johnson, photos and film of his projects, and more. It is not so much a diversion as a campaign, as is much that has to do with the house and Johnson’s legacy. A small tour bus then rides you from the center through green and ritzy New Canaan to the Johnson estate, through monumental gates, to where you disembark. When you walk down the hill and finally spy the glass house (read a more detailed description of the total experience here), you can only contrast its earthbound proclivities to the Mies house’s airy lightness and clarity. And you puzzle, despite (or, perhaps, because of) the heavy hype and near reverence that goes along with it all, at the general paucity of placeness there. The house has presence, but you cannot feel its breath; you stand within it, but you cannot hear it think. 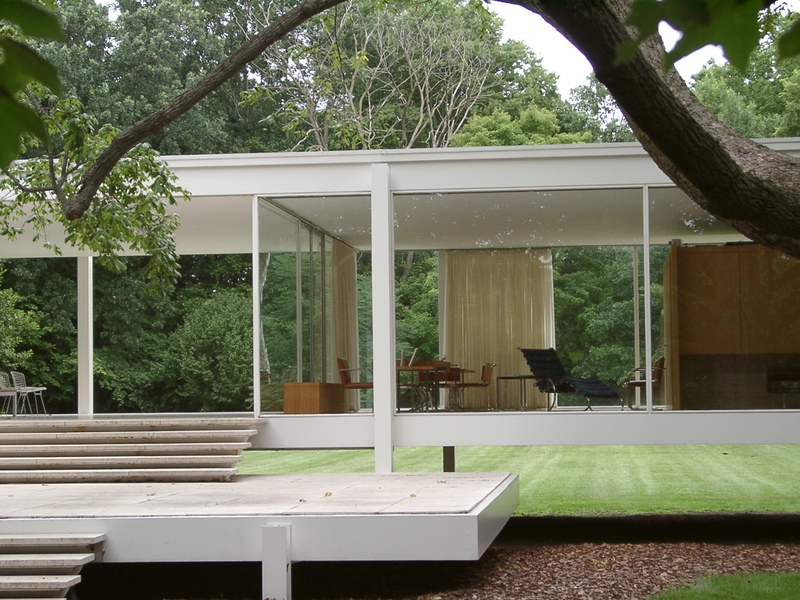 Bottom line: Both glass houses are architecturally, aesthetically and historically intriguing and important. It is just that one seems to have been born, the child of gifted parents, and the other cloned to be raised by friends of theirs. We and Finfer agree on which is which, and which one has the placeness we wish to ponder, wrap ourselves in and let its genius choose us.